Ghahremani, Hooman, Hashemi, Niloofar, Abbaszadegan, Mostafa. (1396). A Review of the Contextual Adaptability of Three Contemporary Urban Paradigms: New Urbanism, Urban Village and Urban Renaissance. معماری و شهرسازی آرمان شهر, 10(18), 71-82. Hooman Ghahremani; Niloofar Hashemi; Mostafa Abbaszadegan. "A Review of the Contextual Adaptability of Three Contemporary Urban Paradigms: New Urbanism, Urban Village and Urban Renaissance". معماری و شهرسازی آرمان شهر, 10, 18, 1396, 71-82. Ghahremani, Hooman, Hashemi, Niloofar, Abbaszadegan, Mostafa. (1396). 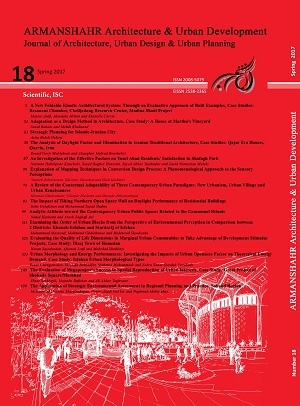 'A Review of the Contextual Adaptability of Three Contemporary Urban Paradigms: New Urbanism, Urban Village and Urban Renaissance', معماری و شهرسازی آرمان شهر, 10(18), pp. 71-82. Ghahremani, Hooman, Hashemi, Niloofar, Abbaszadegan, Mostafa. A Review of the Contextual Adaptability of Three Contemporary Urban Paradigms: New Urbanism, Urban Village and Urban Renaissance. معماری و شهرسازی آرمان شهر, 1396; 10(18): 71-82. 1Assistant Professor in Urban Design, Faculty of Architecture, Urbanism and Islamic Art, Ferdowsi University of Mashhad, Mashhad, Iran. 2Master in Urban Design, Faculty of Architecture, Urbanism and Islamic Art, Ferdowsi University of Mashhad, Mashhad, Iran. 3Associate Professor in Urban Design, Faculty of Architecture and Urban Planning, Iran University of Science and Technology, Tehran, Iran.